Happy National Strawberries & Cream Day! To celebrate, we’re bringing back a popular protein shake recipe from Chef Geo. It’s not only delicious, it’s full of good-for-you nutrition. 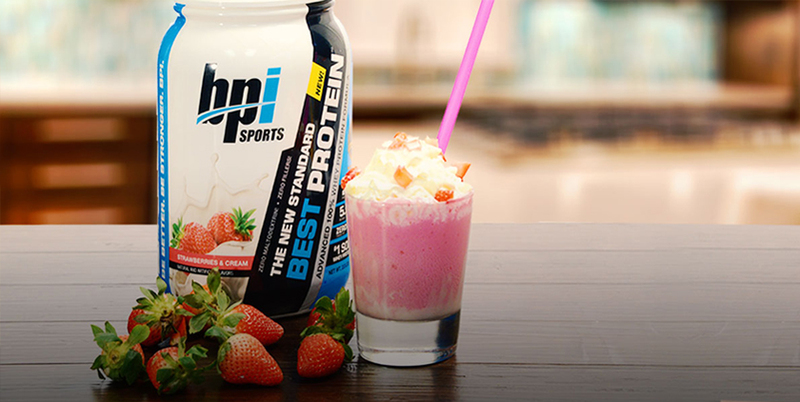 Using BPI Sports Best Protein™, with no fillers or maltodextrin, you know you’re getting quality, 100% whey proteins that will enhance your muscle gains and recovery. At 24 grams of protein per scoop, Best Protein™ is an easy, great-tasting way to boost your protein intake. Strawberries are low in calories and a great source of antioxidant-promoting Vitamin C, manganese, fiber, copper, potassium, biotin, vitamin B and omega 3 acids. Strawberries actually rank 27th among the top 50 antioxidant U.S. foods. They rank 4th among fruits, right behind blackberries, cranberries and raspberries. Use a ceramic cup to microwave the white chocolate chips and coconut oil for about a minute. Make sure to stop the microwave every 20 seconds to stir. Pour the melted chocolate into the glass as you turn it. Use a blender to mix the protein powder, the cashew milk, the liquid stevia, two strawberries and the food coloring. Pour the mixture from the blender into the white chocolate-lined cup. Add the Cool Whip and then top everything off with a few chocolate chips and strawberry slices. Enjoy! Want more? Check out Chef Geo’s Blueberry Caramel Protein Shake.